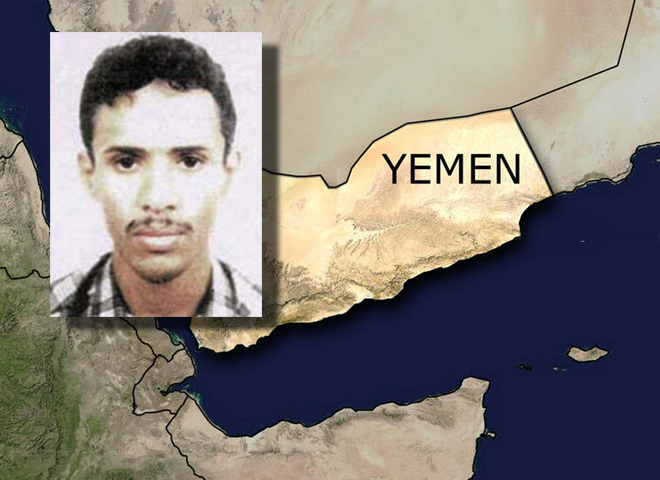 (CBS News) NEW YORK - The al Qaeda terrorist killed in a CIA drone missile strike in Shabwa, Yemen this past weekend was one of the FBI's Ten Most Wanted Terrorists. Fahd Mohammad Ahmed Al-Quso, 37, from Yemen, was most notorious for being an alleged planner of the terrorist attack on the USS Cole that killed 17 American sailors and blew a 40-foot hole in the side of the warship 12 years ago. The U.S. Government had offered up to $5 million for information leading to Quso's capture after placing him on the "most wanted" list in May 2003. Quso had trained in al Qaeda camps in the 1990s, according to federal prosecutors who brought an indictment against him nine years ago. Quso's co-defendant in the Cole indictment, Jamal al-Badawi, allegedly bought the boat and a truck to tow it to Aden harbor and rented a safe house to store it. One of Quso's jobs in the plot, according to the indictment, was to retrieve and hide the car and trailer used to tow the attack boat into position. On Oct. 12, 2000, the day on which two al Qaeda suicide bombers struck the Cole, Quso was meant to videotape the attack in the hills above the Port of Aden for use in al Qaeda propaganda. Quso failed to do so, later telling an FBI agent who interrogated him in Yemen that he had overslept. Quso, Badawi, and eight others were initially caught by Yemeni authorities but escaped from a Yemeni prison in 2003. Yemeni police recaptured Quso in 2004. Though Quso was sentenced to 10 years in prison for the Cole attack, the Yemeni government released him after three years, in 2007, and refused to hand him over to the United States, due to the lack of an extradition treaty. Quso and Badawi would have faced the death penalty if convicted in a U.S. trial. Quso reportedly survived a U.S. cruise missile air strike targeting him in 2009. Quso's one-time al Qaeda handlers are among the top terrorist captives now in U.S. custody - Abd al-Rahim Hussein Muhammed Abdu Al-Nashiri, and Walid bin Attash, a.k.a. Khallad. The alleged top planner of the Cole attack, Nashiri was al Qaeda's chief of operations on the Arabian Peninsula until his capture in 2002. He currently resides in the U.S. detention center in Guantanamo Bay, Cuba, and is undergoing a military commission similar to the proceeding that began for Khalid Sheikh Mohammed and four other alleged 9/11 operatives over the weekend. Nashiri, Quso, and Badawi were also implicated in an earlier al Qaeda attempt to bomb another warship, the USS Sullivans in January 2000, which failed when the small boat sunk under the weight of its explosives. Khallad, also detained at Guantanamo, is one of the five men facing a military commission for the 9/11 attacks. He was reputed to be Nashiri's deputy for al Qaeda operations in the Arabian Peninsula a decade ago and was allegedly a central figure in the Cole plot. According to the 9/11 Commission, Quso was "close friends" with Khallad, who flew scouting flights on U.S. airlines throughout Asia starting in 1999, supervised some hijacker training inside al Qaeda's Afghanistan camps, and met with hijackers in Bangkok and Kuala Lumpur in early 2000. In January 2000, Quso (along with a fellow Cole conspirator) allegedly delivered $36,000 to Khallad in Bangkok, according to the Cole indictment. The 9/11 Commission reported that it had "insufficient evidence" to find whether this money made its way into the hands of the first two hijackers to enter the U.S. - Khalid al-Mihdar and Nawaf al-Hazmi - who were among those at a crucial al Qaeda summit that Khallad attended in Kuala Lumpur. In the video, reviewed by CBS News, Quso threatened that the "mujahideen," or Muslim holy warriors, would fight Americans anywhere, even inside the U.S., and had many would-be martyrs in their ranks. "Fighting the Americans is a legitimate matter. We will fight them wherever we find them. We destroy their ships that are docking off our shores the same way we destroyed USS Cole," Quso said. "We bomb their embassies and consulates like we did in Nairobi and Dar al-Salam," referring to al Qaeda's 1998 twin truck bombings of U.S. embassies in Kenya and Tanzania, which killed 224 people, including 12 Americans. "Better still, we shall take our fight to the heart of your land, launch pre-emptive strikes, and kill their troops in their secure bases the way mujahid hero Nidal Hassan did in Fort Hood," Quso continued in the video. "Aircrafts will also be legitimate targets. We got many people like Umar al-Farouk, and the attempts shall continue."